The Merseyside Tramway Preservation Society is one of Britain's best known transport restoration groups, having originally been established back in 1960 by students from Liverpool University, who wanted to save one of the city's famous Green Goddesses then operating in Glasgow. Since then the society has expanded to include people from all walks of life and gone on to resurrect more than half a dozen tramcars from derelict hulks. Today its collection amply illustrates the development of Britain's first generation tramways from the horse and steam tram era to a fully enclosed electric bogie car. There's also a single deck continental tram and an overhead maintenance wagon from the 1940`s. Nowadays, the historic vehicles operate on the mile long Wirral Heritage Tramway with its spectacular views of Liverpool's world-famous waterfront and perform a unique educational and recreational function, so members of the public and school parties can enjoy a nostalgic journey back in time for a modest fare. If you are interested in vintage transport and have an eye for history then being a member of the society can offer a number of benefits. The modest annual subscription entitles members to travel free on the Wirral Heritage Tramway (on production of a current membership card). This also brings free admittance to the National Tramway Museum at Crich in Derbyshire (except for special days); all members receive a lively and informative newsletter four times a year to keep them abreast of any new developments while our handy website is always kept fully up-to-date with the latest news. If you enjoy working with your hands (or are merely handy with a polishing rag!) 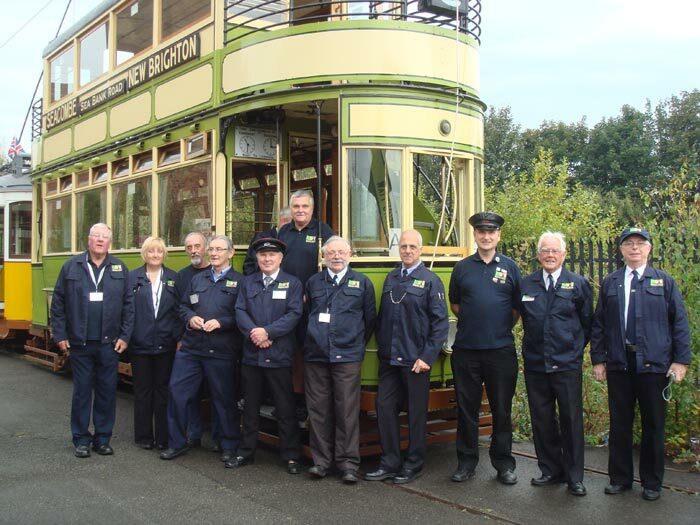 you can join the camaraderie of volunteer working parties and help keep our historic tram fleet on the road! WE help plan other events through the year, such as the popular Santa Specials in December. The annual Wirral Bus and Tram Show is a highlight that attracts visitors from all over Britain. All members are also encouraged to participate in the activities of the Transport Museum, which is operated by Wirral Council.